You want it? TSV has GoT it! A large portion of the world’s population is on the edge of their seats waiting for the "Game of Thrones" season 7 finale that takes place this Sunday. As the TSV team waits with anticipation, we are reminded of the project we did with Red Paper Heart at South by Southwest in Austin, Texas. CIVIC asked Red Paper Heart to create an art installation inspired by HBO’s GoT. This installation was more specifically inspired by the beloved character, Arya, and how she had changed throughout the seasons. The TSV team was super excited to help bring the Game of Thrones Sword Experience to life with our expertise and equipment! With our help, each attendee stepped into the shoes of young swordsmith, Arya Stark. Participants created their own profile, complete with their own photo, and then went on stage to hold a replica of Arya’s training sword. 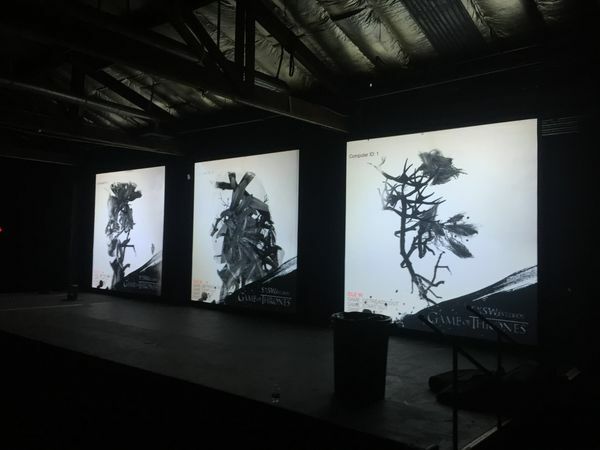 While on stage, fans stood in front of our 10’x10’ Custom Square Projection Screens and swung the sword to hit targets eventually revealing a portrait of themselves made from elements of the show. This portrait was projected using brilliant Barco 12,000-Lumen HD DLP Projectors. Our team flew the Barco systems from the ceiling and routed all of the video with an HD-SDI infrastructure and audio using the Soundcraft Si 24-channel digital mixer. A stunning JBL sound system provided the perfect audio backdrop for the activation. It was critical that all sound and audio worked together exactly; especially considering that the activation accommodated three separate participants simultaneously. TSV was up for the challenge and produced this seamless activation! We enjoyed working with Red Paper Heart to create this great experience. And the fact that it related to one of our favorite shows made it even better! Everyone was extremely happy with TSV’s work, and even asked us to recreate the experience at Comic Con in San Diego. Our team loves delving into creative projects like this and making them come to life for participants to enjoy. Contact TSV for all of your production needs and enjoy Sunday’s episode!